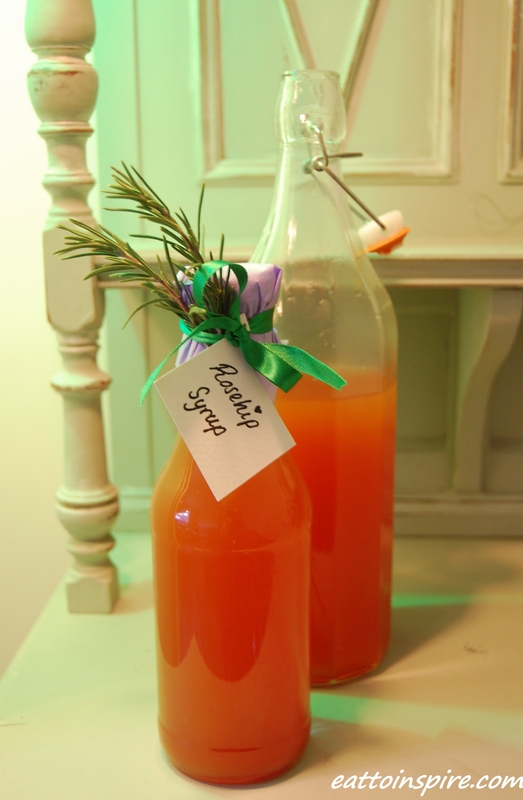 This week I have been inspired by the combined forces of mother nature for supplying me with the ingredients and my resourceful friend Ceri for the recipe to make this sweet nectar. I have never tried rosehip syrup before and over in Bristol the rosehips have pretty much all past it. However, up North, the flora is all on a slightly different timescale. 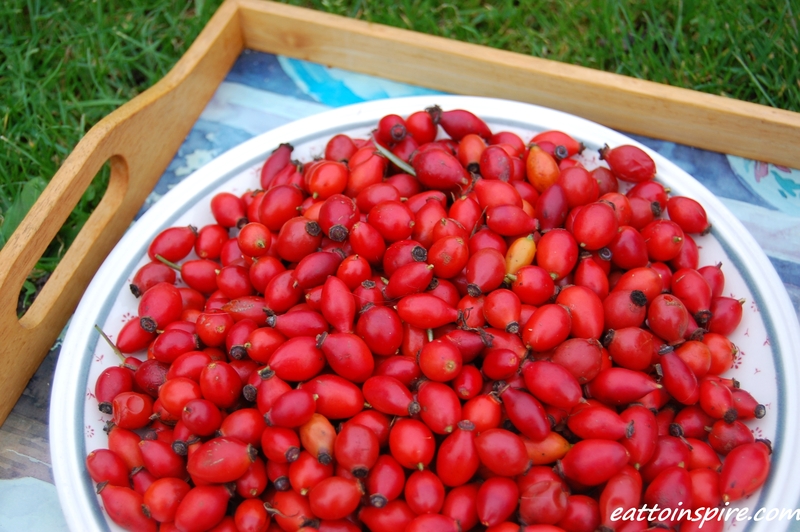 On a recent ramble down a lane I was bowled over to find beautiful plump rosehips en masse. I happened to have a carrier bag with me for just-in-case I happened upon any good foraging opportunities so I filled my boots. Picking rosehips one handed is certainly a skill that I have yet to master, my left hand looks as if I have been fighting a tiger. 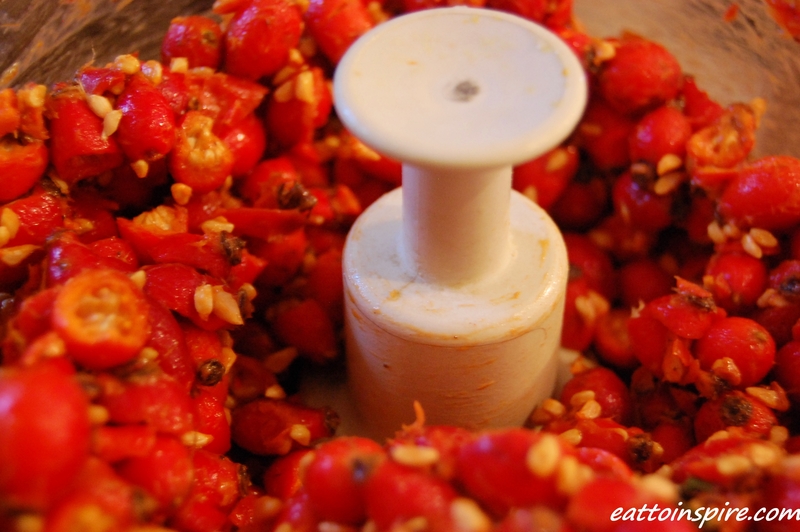 I returned home with my bounty of rosehips and I promptly got to work turning them into this sweet syrup. I was so surprised by the vibrant orange colour, wow. Never in my life have I tried rosehip syrup and I am now addicted to it. I have been having this diluted with water to drink as a cordial, however I have also heard it is great drizzled over nice-cream and desserts. Personally, I can’t wait to get my paws on some gin and begin some grown up apothecary. I have found recipes online for a warming rosehip toddy and a dark rum based concoction. I shall let you know of any delicious creations that I make. As long as there is plenty of dark or golden rum I am sure I will be a happy sailor. Do you want the recipe yet?! Well here it is, from my friend Ceri at Wholesome Little Grain Rosehip Syrup. Even if you don’t want the recipe you should still go and peruse Ceri’s blog for her beautiful, honest writing as well as her delicious food. I dare you not to be inspired by my amazing friend. Whilst I was foraging I also happened upon a huge rosemary bush so I gathered a few sprigs of rosemary which made for some goddamn delicious roast potatoes last night. The same day my mum’s boss sent her home with a jar of homemade apple and blackberry jam as a get well soon gift which was super sweet. I adore jam, but I am a fussy jam snob. I turn my nose up at mass produced jams (except Bonne Maman Berries and Cherries – so good!) and I am a little jam piggy with the good stuff. Everything tastes better with a dollop of jam. I have been invited to a fancy dress party which is this evening. The theme is ‘Animated films of the noughties.’ Me and mum have cobbled together an outfit so I shall be going as Absolem from Alice In Wonderland. 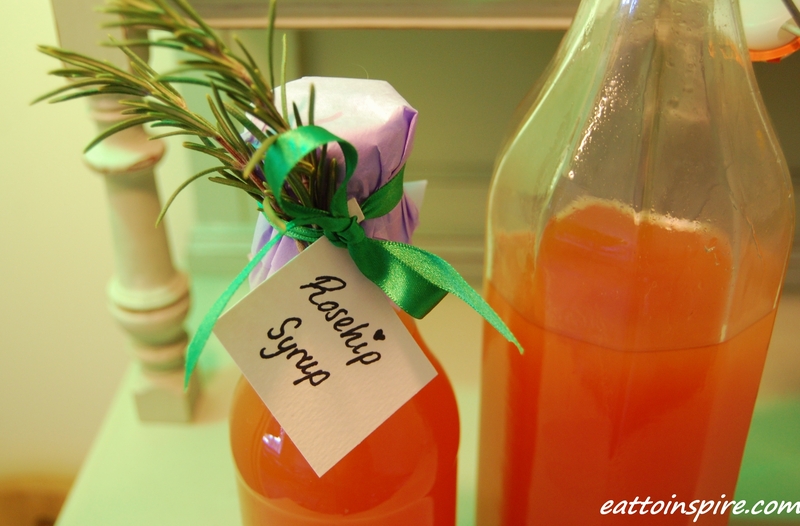 I shall be taking a bottle of rosehip syrup for the hosts. Hands up who doesn’t love a home made gift?! *Nobody, EVER* I thought to use some of my foraged rosemary to add a little pizazz to my presentation. Super cute. 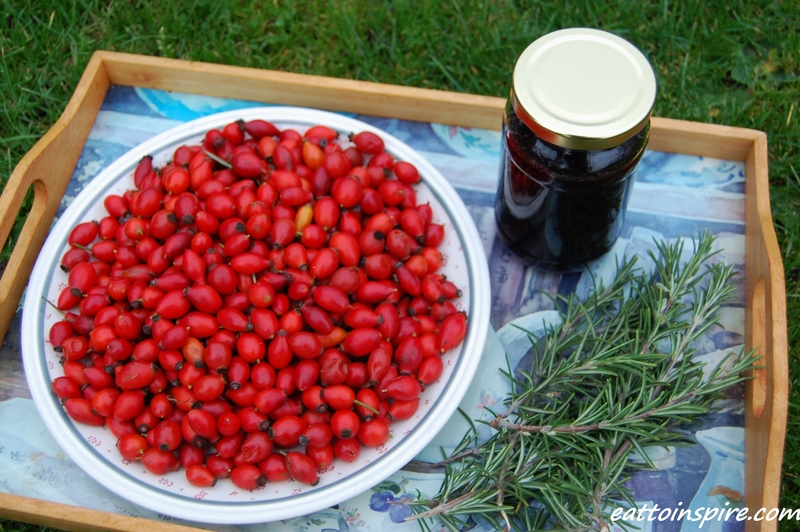 Have you got any recipes that use rosehip syrup? What home made gifts do you like to give or receive? P.s. I shall be doing a life / shoulder / living with the folks update tomorrow! Woah, that’s a lot of rosehips! Well done on your find there, I’m quite sad to have missed them in Bristol while they were in their prime. Never tried rosehip syrup before but I have fond memories of eating them raw from the bush as a young’un!